Being a predominantly blogging and online income blog, one of the most common questions we get asked here at MBT is, what is the best AdSense Ad Configuration for generating maximum revenue. In all honesty, this question is always very difficult to answer, since the description of 'best configuration' can be subjectively varied from blog to blog, meaning its hard (probably impossible) to create a set-up that works for every blog. The best way to address this issue is to try out various configurations on your blog, and decide by hit or trial which is best. 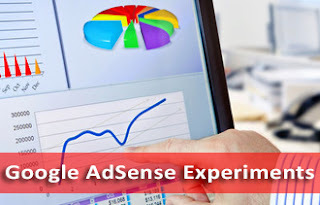 Fortunately for you, the Google AdSense experiments feature is here to help. To see if certain changes can help you optimize your ads better, the best approach would to be to run an A/B experiment. An A/B experiment for an ad lets you compare the original settings for that ad against variations of those settings which you can choose from. You can then evaluate their performance. These experiments don't need you to change your ad or webpage code. You can do a lot with these ads. For example, you can compare your text-only ads to text-and-display (graphics) enabled ads, and see which performs best. Again, this detail is subjective, and could vary from site to site. For example, text-only ads might help an article base website more, whereas gaming websites might benefit more from visual ads. You can also check out visual settings for your ads. For example, test what color schemes attract more clicks, or what sort of borders work best. 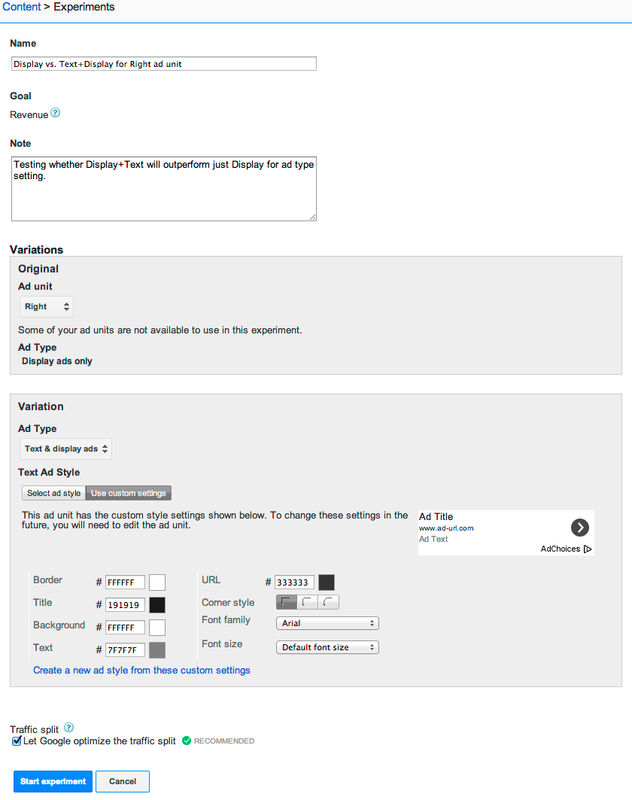 Or, analyze the effect of changing the color of ad text on ad performance. 24 hours after setting up an experiment in your account, you’ll see a confidence score for the two ad units settings. This score will tell you how likely either of the two settings (original vs variant) are to perform better in the long run. As the experiment progresses, these confidence scores may change. So it's probably a good idea to wait a while for the score to mature, and let one of the scores reach 95% before making a decision as to the setting you're going to select. Upon selection, the experiment ends, and the new setting is applied automatically. Please note that while an experiment is running, our system will automatically optimize the traffic split between the two ad unit settings. The better one setting performs, the more traffic it will receive, helping you maximize your revenue potential even during the experiment.